These days the talks of location based services are very hot in the industry. In fact even outside the mobile telephony industry even advertisers are watching the technical developments in the space of mobile based location services very curiously. Location based services arouse so much interest because they will fundamentally change the utility curve of the mobile phone and PDAs for good. Just think what impact will these services will have on the pizza chains, the traffic sites, the supply chain management companies and the media and you will begin to grasp the value these services will be adding to the daily lives of people. Imagine an application that lets you choose the pizza from a predefined menu and orders the closest pizza corner. Imagine the savings and control the supply chain management companies will be able to achieve by using location based mobile services. It was sensing this impending revolution that the founders of J2ME came out with the Location API contained in the JSR 179. This API is in form of an optional package that could be added by handset manufacturers to the device based on there desire. The minimum version of CLDC needed to run this API is CLDC 1.1. This optional package could also be added on top of the Connected Device Configuration (CDC). This class contains the textual address information about a location. The information may include information like street name, postal code, city etc. This class defines field constants that can be used to retrieve specific field data. This constructor constructs the AddressInfo object will all field values set to null. This address field denotes a building floor. This address field denotes a building name. This address field denotes a building room. This address field denotes town or city name. This address field denotes a country. This address field denotes a country as a two-letter ISO 3166-1 code. This address field denotes a county. A county is an entity between a state and a city. This address field denotes a street in a crossing. This address field denotes a municipal district. This address field denotes an address extension, e.g. house number. This address field denotes a phone number for this place. This address field denotes a postal code. This address field denotes a state or province. This address field denotes a street name and number. This address field denotes a URL for this place. This method returns the address field string. If the specified field is not set this method will return null value. This method sets the value of an address field. This class represents location coordinates as latitude-longitude-altitude values. The latitude and longitude values are represented as decimal degree values. The decimal values are in form of float values. It also provides convenience methods for converting between string coordinate representation and the double representation used in this class. o latitude - the latitude of the location. Valid range: [-90.0, 90.0]. Northern latitudes are represented by positive values while southern latitudes are represented by negative values. o longitude - the longitude of the location. Valid range: [-180.0, 180.0). Eastern longitudes are represented by positive values and western longitudes are represented by negative values. o altitude - the altitude of the location in meters. It is defined as height above the WGS84 ellipsoid. The Float.NaN value indicates that the altitude is not known. This field is an identifier for string coordinate representation Degrees, Minutes, decimal fractions of a minute. This field is an identifier for string coordinate representation Degrees, Minutes, Seconds and decimal fractions of a second. This method returns the azimuth to the destination in degrees. The result shall be within the range [0.0, 360.0]. This method converts a double representation of a coordinate with decimal degrees into a string representation. This method converts a String representation of a coordinate into the double representation. This method calculates the geodetic distance between the two points according to the ellipsoid model of WGS84. The altitude is neglected from calculations. This method returns the distance to the destination in meters. This method returns the altitude in meters above the reference ellipsoid for this location coordinate. This method returns the latitude in degrees. This method returns the longitude in degrees. This method sets the geodetic altitude for this point. This method sets the geodetic latitude for this point. This method sets the geodetic longitude for this point. This class is of prime importance in selecting of the location provider. This method constructs a Criteria object. This field stands for a constant indicating no requirements for the parameter. This field stands for a level indicating high power consumption allowed. This field stands for a level indicating only low power consumption allowed. This field stands for a level indicating average power consumption allowed. This method returns the preffered power consumption level. This method returns the preffered maximum response time in milliseconds. This method returns the vertical accuracy value set in this Criteria. This method returns whether the location provider should be able to normally provide textual address information. The returned value true means that it should be able to do so. A return value of false means that AddressInfo is not required. This method returns the preferred cost setting. The returned value true means it is allowed to cost. A return value false means it must be free of charge. This method returns whether the location provider should be able to determine altitude. The value true means that it should be able to return the altitude information. The value false means that the ability to return the altitude information is not required. This method returns whether the location provider should be able to determine speed and course. True means that it should be able to do so. False means that this is not required doing so. This method sets whether the location provider should be able to determine textual address information or not. This method sets whether the location provider should be able to determine altitude. The default value is false. This method sets whether the requests for location determination is allowed to incur any financial cost to the user of the terminal or not. This method sets the desired horizontal accuracy preference. The horizontal accuracy is given in meters. This method sets the preferred maximum level of power consumption. This method sets the desired maximum response time preference. This method sets whether the location provider should be able to determine speed and course. The default value is false. This method sets the desired vertical accuracy preference. The vertical accuracy is given in meters. The Landmark class represents a landmark, i.e. a known location with a name. This class is only a container for the information on a landmark. · description – The description of the landmark. It may be null if not available. · coordinates - The Coordinates of the landmark. It may be null if not known. · addressInfo - The textual address information of the landmark. It may be null if not known. This method returns returns the description of the landmark. It may return a null if no description is available. This method returns the QualifiedCoordinates of the landmark. It may return null if they are not available. This method sets the AddressInfo of the landmark. This method sets the description of the landmark. This method sets the name of the landmark. This method sets the QualifiedCoordinates of the landmark. This class provides methods to store, delete and retrieve landmarks from a persistent landmark store. This method adds a category to this LandmarkStore. This method adds a landmark to the specified group in the landmark store. This method creates a new landmark store with a specified name. This method removes a category from this LandmarkStore. This method deletes a landmark from this LandmarkStore. This method deletes a landmark store with a specified name. This method returns a java.util.Enumeration containing Strings representing the category names. In case there are no categories defined in this LandmarkStore, an Enumeration with no entries is returned. This method returns the LandmarkStore object representing the specified landmark store. It will return null if a landmark store with the specified name does not exist. This method returns an Enumaration that lists all landmarks stored in the store. This method returns an Enumaration that lists all the landmarks that are within an area defined by bounding minimum and maximum latitude and longitude and belong to the defined category in case it is specified. This method returns an Enumeration containing all the matching Landmarks. It may return null if no Landmark matched the given parameters. This method returns an array of landmark store names. This method removes the named landmark from the specified category. This method updates the information about a landmark. This field tells that the location method is unassisted. This field defines the location method technology: Angle of Arrival for cellular. This field defines the location method technology: Cell-ID for cellular. This field defines the location method technology: satellites. This field defines the location method technology: Short-range positioning system. This field defines the location method technology: Time of Arrival (TOA) for cellular / terrestrial RF system. This field tells that the location method is of type network based. This field tells that the location method is of type terminal based. This method returns an AddressInfo associated with this Location object. This method returns the terminal’s course made good in degrees relative to true north or Float.NaN if the course is not known. This method returns string encoded according to the format identified by the MIME type defined in the parameter. This method returns a bit field identifying the used location method. This method returns a QualifiedCoordinates object. If the coordinates are not known it returns null. This method returns the current ground speed in m/s for the terminal or Float.NaN if the speed is not known. This method returns a timestamp representing the time. This method returns a boolean value with true indicating that this Location instance is valid and false indicating an invalid Location instance. This interface represents a listener that receives events associated with a particular LocationProvider. Generally the device shall attempt to provide the application with position information at regular intervals. But the frequency of this information can not be guaranteed due to various factors. This method is called, by the LocationProvider to which this listener is registered, periodically according to the interval defined when registering the listener to provide updates of the current location. This method is called by the LocationProvider to which this listener is registered if the state of the LocationProvider has changed. This is one of the most important classes of Location API. It represents a location-providing module which generates locations. You can use an instance of this class by using the factory method getInstance which is explained below. This field may be returned by the getState method. This field tells that the location provider is available. This field may be returned by the getState method. This field tells that the location provider is out of service. This field means that the provider is unavailable and the implementation is not able to expect that this situation would change in the near future. This field may be returned by the getState method. This field tells that the location provider is temporarily unavailable. This field means that the method is unavailable due to reasons that can be expected to possibly change in the future and the provider to become available. This method is used for adding a ProximityListener for receiving updates when proximity to the specified coordinates is detected. 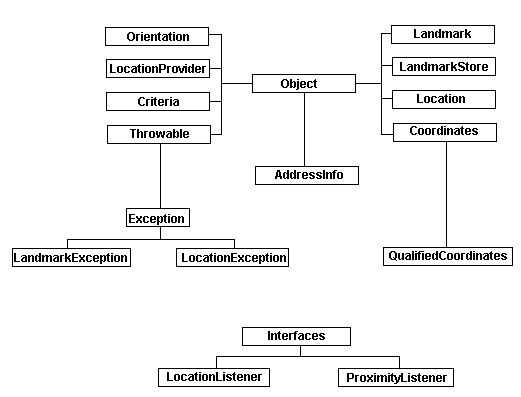 This factory method is used to get an actual LocationProvider implementation based on the defined criteria. This is the factory method that is used for getting an instance of this class. This method will throw the LocationException if all supported location providers are out service. If this method returns null then it means that there are location providers in the system that were not returned because the criteria did not match. This method returns a location object. A null value is returned if the system does not have any previous location information. This method returns a Location object. This method returns the availability status of this LocationProvider. This method removes a ProximityListener from the list of recipients for updates. This method resets the LocationProvider. This method adds a LocationListener for receiving updates at the defined interval. This class is only a container for the information. This constructor constructs a new Orientation object with the given parameters. It does not validate the values while accepting them. The values are expressed in degrees represented in form of float values. This method returns the terminal’s compass azimuth in degrees relative to true or magnetic north. This method returns returns an Orientation object containing the terminal’s current orientation or it returns null if the orientation can’t be currently determined. This method returns the terminal’s pitch in degrees or Float.NaN if it is not available. This method returns the terminal’s roll in degrees or Float.NaN if it is not available. This method returns true if this Orientation is relative to the magnetic field of the Earth. Otherwise it returns false if this Orientation is relative to true north and gravity. ProximityListener interface is used as a listener for events associated with detecting proximity to some registered coordinates. It is called when the terminal enters the proximity of the registered coordinates. It is called only once when the terminal enters the proximity of the registered coordinates. Thus applications which need to listen to this sort of events regularly must re-register. This method is called to notify that the state of the proximity monitoring has changed. This method will be called by the platform when it is detected that the current location of the terminal is within the defined proximity radius of the registered coordinates. This class represents coordinates as latitude-longitude-altitude values that are associated with an accuracy value. This constructor constructs a new object of this class with values in the parameters. This method returns the horizontal accuracy in meters. It may also return Float.NaN if this is not known. This method returns the vertical accuracy in meters. It may also return Float.NaN if this is not known. This method sets the horizontal accuracy of the location in meters. This method sets the vertical accuracy of the location in meters. This exception is thrown when a location API specific error occurrs. This exception is thrown when an error related to handling landmarks has occurred.